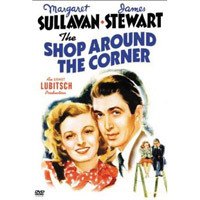 Director Ernst Lubitsch didn’t just survive the transition from silent films (in which he already had an estimable career) to sound, he flourished: Talk became him, as did all the subtleties of human behavior that exhibit themselves when actors talk to each other, no better example of which is Margaret Sullavan and James Stewart. Lovers in Budapest, Sullavan and Stewart don’t know they love each other but in fact imagine they may well despise each other, revealing themselves only in secret until Stewart catches on that they’re correspondents in an anonymous exchange. No other director could have managed so well as Lubitsch their exquisite chemistry not to mention their grace in the crossfire of farce, tragedy, and romance while, just offscreen, loom the unforgiving barbarities of fascism. In an age when American audiences need to be told what kind of movie they’re seeing before they see it, it’s impossible to imagine movies like The Shop Around the Corner were ever made. If perfection and greatness aren’t always the same thing—maybe they’re rarely the same thing—here they are, and that Lubitsch never won an Academy Award nearly invalidates Oscar history all by itself. Previous articleRepeat Offender: How Bartender-Turned-Model Mark Wystrach Ended Up in Los Angeles Magazine. Again.